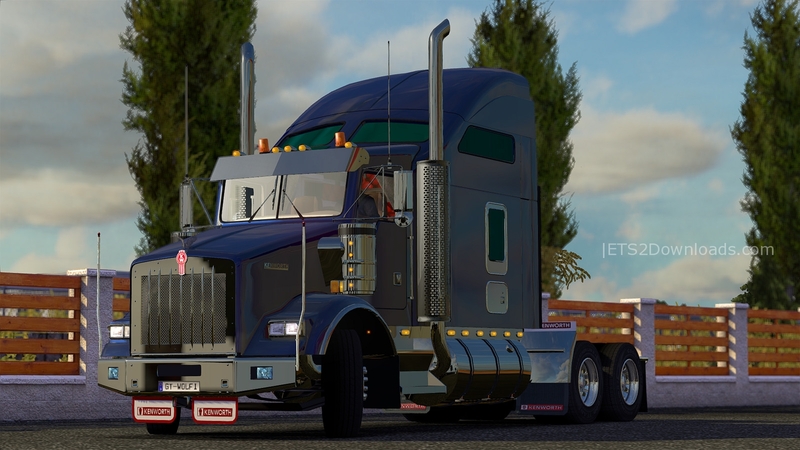 This Kenworth T800 is a real nice truck, in 1.15. BUT if you have updated to 1.16 beta like I did, then you will have some trouble with it. So, with this truck you get a large number of engines, 3 type’s to be exact. I tested all 3 type’s of engines. They all ran very well, and the sound was very well done too. You get 5 transmissions. If you have a steering wheel you will be very happy with the choices here. You get 1 cab, 1 chassis,”no mid or taglift here”. You get a real nice set of external cab options, with minimal lights. You buy this truck at the DAF dealership. Just thought you would like to know. Now, when I went to put on the hood mirror’s, the left side one does not work, I am not sure if that is a problem with the mod, or if it was by design. I believe that was the only problem I had with this truck. I will there for Recommend this truck to any one that want to drive it. Add new chassis with lifted axle. Added some new tuning parts. on it soon XD. It has smoke stacks!!!!! Nice but knowing what dealer is important because some of us, like myself, have several American trucks . Hi, It’s the DAF dealer! ..which is not in conflict with the Kenworth K100, which also awaits its buyers at the DAF shop. Ok 1st off good work on the trucks guys, however noticed big glaring problem with in cab view and drivers hood mirror. It shows nothing but a big red circle and has no reflection at all. Otherwise love the truck and am playing with it now. Hi guys,I’m new in this thing of the mods for ETS 2,I can make awesome skin for the trucks but i don’t know where I can find templates 2D/3D or contact the autors for request the templates..
Nice, thanks for sharing mate! Whats up with the left side hood mirror. I can’t any use. Ye seems like it is still error. The left mirror is bad, i dont know why. Thank you so much mate. I have added it into the post. The author has some troubles with the left mirror! Hey sup people, i have 1 question, i dont know if i update to 1.16. I haven’t noticed any problems. The 16 speed transmission should be an 18 speed. It has two reverse gears; if they count, it makes 18 speeds. What I mean is 18 forward gears. Well, it’s no hard to do that, if you really want it. Takes some experimenting to find the right ratios, or even to google them up, but you should be able to do this in notime. And then maybe you post it. I guess it would be your first mod. What a perspective, don’t you agree? I love this truck! only problem i have is at night i have lights flickering inside the cab? is that a bug in the truck or a mod conflict. i have seen this in other truck mods here and there and figured it was just bugs in the truck mods. I see this in almost any standard truck, usually at the lower supports of the left rear view mirror, where it is fastened to the cab, regardless what graphic engine I run. I haven’t noticed it on the T800 yet however. So I’d tend to blame ETS2 rather than the mod. I’d try and experiment with the graphics settings (Antialiasing, Filtering, Vertical Sync, Skaling). I haven’t yet adressed the problem on my standards. I take it, you are sure it is not traffic flashing at you because you use the high beam. They also do that from behind, you know. thanks for the tips. will try when i drive it again. And you say you have the same kind of flickering in other trucks too, but only in some, right? In this new light, I’d check for conflicting mods. Perhaps your game log will give you a clue after it happened again. If not, there’s just the trial and error method. I can assure you, this mod works like a charm on my end. thanks. yeah on past mods i nixed because of it. lol i did some digging and it could be a number of things so trial and error like you said sounds like the way. megastore was one culprit for some in the past and i may have it active…will check. Yeah, I know that feeling. I got the new TSM on my HD and yet need to finish my Africa haul. So good luck then. If you nail the problem, it would be nice if you let everybody know what caused it. Truckers appreciate when a mate tells them via CB on what avenue trouble lurks in the dark, so they can avoid it. But not with the T800! 🙂 I had that yesterday on a moderate offroad path. To put it in british terms, you may find your fun slightly disturbed when the drive axes’ grip becomes suboptimal because your chassis takes some mud samples. Seriously, the aircleaners as well as the bumper guides have lights on them. So whatever causes the problem messes with the depiction of lights or shares a definition (or definition name) with these accessoires. This could be either accessoires of another mod truck, or some mod that defines lights in any way, a weather mod perhaps. I put the truck as the last mod and reinstalled the bumper guides and the air cleaner. Flickering at night once again. This time I took off the bumper guides first and it stopped! The air cleaner is ok! 🙂 So the bumper guides alone were causing the flickering. …which eliminates turn signals and cateyes, and narrows the problem down to red lights. What interiour do you use in the cab? I was actually refering to the three choices you are given by the mod. Well, so for now, you’re satisfied. But keep in mind, the problem still remains, and I am convinced, it is not caused by the T800. It might happen that you run into a similar problem with the next truck mod you install. Anyway, have fun! PS: I’ll be contacting you in case the problem shows up on my end. And be sure, if so, I’ll nail it! Well if you figure it out, please let me know. For the moment, i’m through hunting this Easter egg. lol By the way, what exactly did you mean by “red lights”. I was just in the service shop parking lot with no red street lights around and no traffic. I did read by turning reflections on high that solved the same problem for another guy on a different truck mod one time…can’t recall the truck though. I have to run my reflection and all else on low, except for textures which is on high, for our pc to run ETS2 smoothly. Now that’s some comfort. So I’m not the only one with a prehistoric computer. I usually turn shadows (very reluctantly) and grass off, but run high textures, ultra weather and high reflections. I have learned to live with the fact that in some areas, I will have CTD’s due to OOM. On the other hand I have 4 JazzyCat Traffic packs and the russian one from Goba running at the same time. Just too sweet to turn off. I just realized, I still encounter trucks and cars that I haven’t seen before, though I run these packs for weeks. I relieved the situation with that traffic mod I published (advertising! advertising! Go, get it!! ), running my traffic density at 20X20 or 25X25. I also do quick saves rather frequently, that’s why I asigned a button to my gamepad for it. Well, red lights: As far as I understand it at this time, it works a little like my traffic mod: While a light in the body shop defines a singular part for your truck, the author may alos out in a global file to define how lights in general shoud be displayed. While JazzyCat’S traffic packs, define the trucks and cars you see, my density mod is global, for it defiens how many and what type (car vs truck) you see, no matter what traffic packs are installed. SO it has a global effect. When somebody globally defines the depiction of, say, red lights, he might cause that it looks nice on his mods but bad on others. Some definitions, if you have a bunch of mods, rule each other out or overide one another. The sim loads mods from top of the list to bottom of the list, and like in the army, last order counts. Sometimes, the problem is simply that an author used an already existing name for a new item (talking about names within definition files), which sometimes can be spotted in the game log, when ETS2 get’s angry about it. Mods that define light in general, like the AI-lights mod and some weather mods also can cause sideeffects like this, because they with the depiction of light or even bring new stes of textures for it that will not be suitable for each and every mod. And sometimes, it’s plain and simple an error, a flawed mod part, like these left turning lights on Ohaha’s F16, our outdated, because designed for a prior ETS2 version.. In that case, once you can’t correct the situation, you just leave out the part. I put some cateyes there which look exactly the same. I take it we are not talking about a traffic light that has temporarily or permanently been shut off? These things exist even in ETS2, and they are not announced by blinking yellow lights in all countries. Even here in (real life) Germany, I saw both variants. By “narrowed down to red lights” (the bumper markers has a red one on top), I ment that in the body shop (if this is a case of conflicting truck mods) we can concentrate on accessories that emitt red light. You may have a truck in there which has a red lighted accessory which causes the mess, no ned to check for cateyes or white light sources. Am I asuming correctly that you mounted one or two default radians onto the lamp bar on top of the roof? i didnt have the magnum tuning mod at the time. i do now though but i got it just the other day. If you have for instance the DAF-Mod or any other tuning mod with radiants globally replacing the standard ones, and this below the Renault mod, it rules out the Renault radiants with correct ones. On the other hand, the author of the Renault mod might use these radiants in other mods of his, too. When you have not much advanced in rank yet (I started a new profile), you will have these radiants right from the start as the unlock treshhold is set to zero. It seems, they are triggered by low beam light (not parking light) rather than by the standard radiant key. If you have a trailer with radiants, those will still obey the radiant key while those on the truck won’t. From the cab and its sleeping compartment to the soundsets a pure love affair. I haven’t noticed any framerate impact, no complaints from the game log, nor any vices of the truck: It handles like you would expect it from a machine this size, and pushing it offroad in Russia is not the best idea, at least not if you have a trailer attached, for you bottom up easily and so lose your traction. Like mentioned in the video, seating is kind of an issue. You can move your seat sufficiently back and to the left to see the left mirror however, and with the front mirrors installed, you don’t even need the fake right mirror. Exhaust smoke effects are obviously not forseen by SCS, so you can buy one for 10000 bucks (!!! The paint just costs a single buck…) which would be active permanently, and the two streams of smoke would come together over the cab … strange wind pattern. And as we’re talking about money: Fully upgraded, this 600HP Monster will cost you around 74000 Euro. The cheapest default in basic config (the Stralis, I think) does not change owners under 97000… So either the dollar has lost a lot of it’s value, or this Kenny is offered at dumping price! Anyway, this Baby is a joy to ride. Thanks for sharing! Great, thanks for the great review mate! I have set it as Featured comment! Seriously, this is not a review, because it only works together with the real review and the video, for I only covered things that have not been addressed before. However, your gesture is much appreciated. Thank you! You are very welcome :D.
Volgens mij is dat goed nieuws. Geniet van je rit, buurman! Like your truck but….the sound is horrible! Please work on it, for me this sound is a mix between a sawingmashine and a f**cked up lawnmower. So I have to drive it on mute. An other issue is the right-side hood-mirror; the trailer is invisible there. Do you have that problem with all three soundsets? I suspect there might be something wrong on your end, because all three sets are pretty authentic, well blended and flawless in their coding. It is pretty hard to satisfy my pretty sensitive ears, but this one does, you know. Sorry, I got no idea. This truck needs some good and awesome looking 64bit skins. I don’t know about the bit format, but you’ll find tons of nice skins for this baby right on this site. what trouble will I have on 1.16 with it? I am on Version 1.16.2 and it works brilliantly. Perhaps you could describe your problem and have a look what your game log tells you? I suspect a mod conflict here. finally got some time to get caught up on some mod reviews and this was the first to try with that new UPS skin pack. Short response is this is a great mod. Video review to follow soon. Hi, I am using 1.16 and everything is ok.
Are you using other mods together? Please try to disable some truck mods then try again! Try to disable them all. 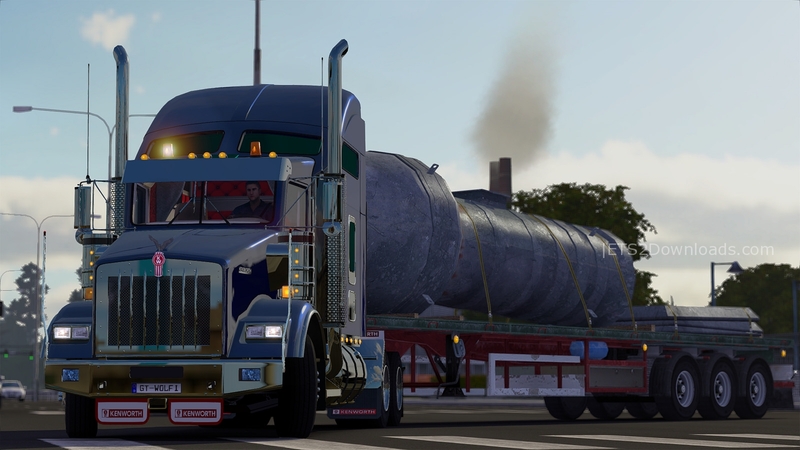 I am using the Custom Peterbilt, Volvo 2013 with this truck and everything is ok! Unfortunately this mod not work for me. When i click on truck game will crash. I had removed previous t 800 and k 100 (sell all kenworth trucks i had, still not work) hope someone can help me about this, seem to be a really nice mod. Can you try to run it with new profile? It works fine with me :(. I downloaded this current version and had a look through it, and decided to stick with the old version, on the grounds of “if it ain’t broke, don’t fix it”. Oh….and this version is tagged as “beta”….so that might explain a few things. If you want to try version 1.02, I still have the archived file, and could find a way to get it to you. Sometimes, “newer” doesn’t always equate to “better”. Ha!! Thanks Will, but I already have that mod saved. I think Florin will find your link useful though. Thank you both, i have the old mod is in my back up directory, just wanted to see new mod how is it. Thank you again to both of you. I agree with you, old version work just fine, but i thought try new one especially because i seen that they add some chassis, will stick to old version which i think is great, maybe a later version will work. Just to take a balanced approach on this new version, I went back and tried it again. The first thing that became apparent was that it appeared to be a bit of a resource hog….frame-rate definitely took a hit….mind you, it was pouring with rain too, so this may have influenced performance somewhat. That puzzled me a little, so I then ran the older version in an identical weather scenario…..with no impact on frame-rates, and graphics running silkily smooth. The only thing I’m wondering is how large the textures are in the new model. Link broken? When at mega and I have pressed download I just get the faild to download error thing. Is there another link or will the current one get fixed soon? bij mij 1.17.1 werkt et niet hoe? Can you use English please? He wanted to know if it would work on 1.17.
now that i got it working right, this is an excellent truck. One of my mainstay trucks along with the W900b Longline and Scania Longline Trucks. Great work. Awesome why can’t i go in to the sleeper like on earlier mods of the truck? How do I shift into gear 17 & 18? i have the logitech g27 and can only shift up to gear 16. Thank you! Will this work on 1.21? Of course, Without any problem buddy! Just updated the new download link buddy!